This is one common piece of storage you are likely to find in almost every working class home in Mumbai. In Marathi it is called Mandhani (Correct me if I am wrong). Be it a Maharashtrian home, Gujarati home or a Marwari home you will find this shelf in every kitchen. It is made up of thin sheets of steel and is hung on nails which are drilled into the wall. 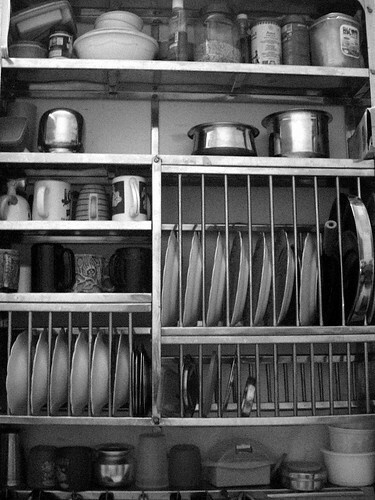 These shelves are used to store/display steel and aluminum utensils, sort of a kitchens central focus During Diwali the entire shelf is removed washed, and the utensils are scrubbed to shine and displayed on these shelves. Sadly with the fad of modular kitchens, many homes are now disowning this piece of furniture. Neither a Maharashtrian nor a Gujju here but we’ve got one of those as well! I only didn’t know what it was called so far. :-D Great pic by the way.